Mix flour, baking powder and salt in a bowl. Stir in milk and oil until a soft dough forms. Turn dough onto a clean, lightly floured surface and knead 6 to 8 times. Dough should feel soft but smooth; not sticky. Shape dough into a ball. Turn the bowl upside down over the dough. Let sit for 10 minutes. 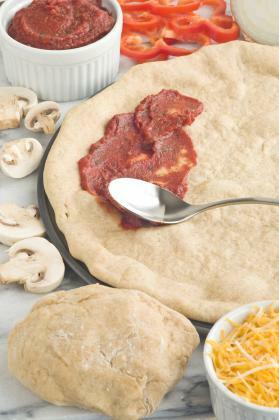 On a baking sheet, roll or press dough into a 12 inch circle. Bake crust at 400 degrees F for 8 minutes. Remove from oven and add your choice of sauce and toppings. Return to oven and bake until light golden brown, 12 to 20 minutes. Serve hot.